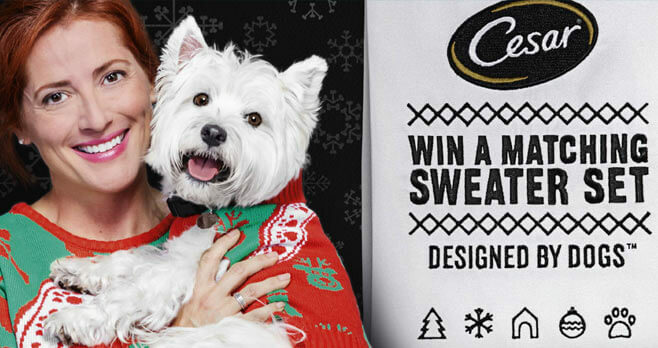 Visit www.cesar.com/twinning now because you could win a holiday sweater set (one of you and one for your dog) during the CESAR Twinning Holiday Sweater Sweepstakes running online between November 5 and December 5, 2018. The CESAR Twinning Holiday Sweater Sweepstakes is open to legal residents of the 50 United States or the District of Columbia, above the age of majority in their place of residence. The Sweepstakes begins at 9 am ET on November 5, 2018 and ends at 11:59 pm ET on December 5, 2018. Entrants are limited to 3 entries per person throughout the Promotion Period. The grand prize consists of a set of matching sweaters, one for the entrant and one for their dog. Visit www.cesar.com/twinning to enter and see Official Rules for details.